This post originally ran 3/18/2013. We're re-running it in celebration of DOMA's demise, the overturning of Prop 8, and in solidarity with our LGBT brother and sisters. 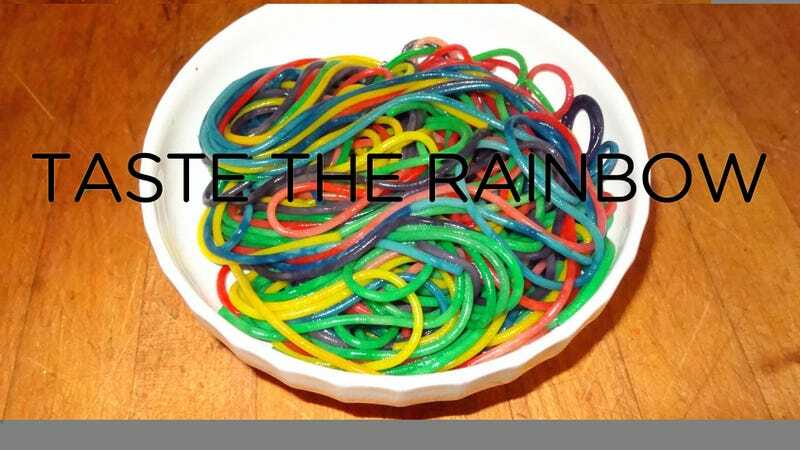 Plow through a couple of bowls of rainbow pasta today to be ready for whatever the SF Pride Parade throws at you. It's been a brutal day at work, you're dead tired, and you realize it's your turn to make dinner for the kids. But rather than concede defeat (read: order take out), here's a simple pasta-based hack that takes practically zero effort and will keep your kids entertained so you can maybe enjoy a meal in peace for once. You aren't completely dead inside. Or if you have kids. Freaking people out with your newly multicolored tongue. Keeping your hands from looking like you've been in the kids' finger paints again. If you can cook pasta and place it in a plastic bag, you can do this. As the pasta is cooking, take a moment to to put about twenty drops of each color food coloring into an individual bag and add two tablespoons of water. Once the cooked pasta has been initially doused in cold water, transfer an equal portion into each bag. Close the zipper, give each bag a good shake to coat and let the pasta marinate for about five minutes. After that, drop each bag of pasta back into the colander and give it a good rinse with cold water to remove any excess dye and lock in the absorbed tinting before transferring it back to the pot. Add a tablespoon of olive oil to keep the pasta from sticking if you like. Use a pair of serving tongs to toss the stands and serve. A small pat of butter and grated parmesan is always a hit with the kids. Eat your plain yellow pasta like a schmuck.